For just $1,800, you can own the world’s first commercially available smart feline treadmill. The app-controlled device is effectively a sleek-looking ring designed to get your cat into shape, Engadget reports. Developed by Korean startup The Little Cat, it also uses recorded voice messages to coax your kitten into exercising and a LED light that the cat “instinctively follows.” The future is now. Nevermind self-driving cars; it’s now all about the self-rolling suitcases. ForwardX is back at CES this year with an updated version of Ovis, a self-driving robot suitcase that can roll alongside its owner like a loyal dog. ForwardX, a Beijing-based startup, developed Ovis with the help of online crowdfunding, earning them the super-specific title of "the most funded AI suitcase in the crowding history." It’s much more than just a suitcase with a motor attached, the system uses machine learning algorithms and live digital videos to master facial recognition and multiple object tracking while tramping around the airport with you. 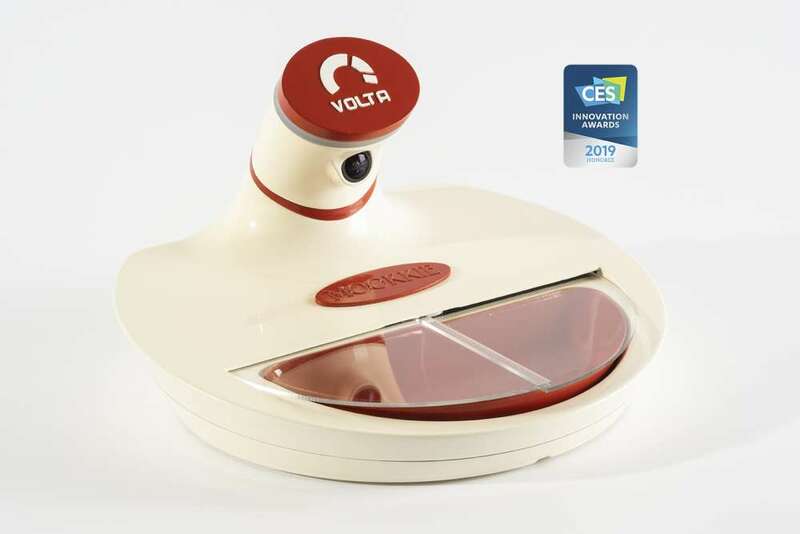 In other news of essential must-haves for your pet, Volta has revealed a smart pet bowl, called Mookkie, that’s capable of registering each of your pets’ faces and distributing the correct food. As BBC News reports from Las Vegas, a couple of companies have announced breathalyzer-type gadgets that are capable of giving your breath a sniff, working out how you can improve your diet, then sending nutritional advice to your smartphone. Lumen’s device picks up on carbon dioxide levels in the user's breath to make assessments about a person’s metabolism, while FoodMarble detects hydrogen levels to make deductions about a person's digestive health.